Although the photographs that Bill Johnston and Eiko Otake made for “A Body in Fukushima” are impressive and affecting strictly on their own terms, they acquire even more significance when we recall the historical events that provide the context for the images. The disaster that occurred at Fukushima is almost beyond comprehension. On March 11, 2011, off the east coast of Japan’s Honshu Island, there occurred a massive earthquake. It registered 9 on the Richter Scale, making it one of the most powerful quakes ever recorded. The seismic upheaval in turn generated a huge tsunami, a wave whose crest is estimated to have reached some 130' high in some locations. The combined blow from these two natural cataclysms destroyed hundreds of thousands of homes and left at least 16,000 people dead. In addition, as the world now knows, the precariously located Fukushima Daiichi Nuclear Plant afterward suffered a catastrophic meltdown of its three reactors. There resulted a release of huge amounts of extremely radioactive debris, steam, and water. The authorities ordered that the entire region around the plant be evacuated to a radius of 12 miles, a zone that was extended even further in some areas. The edict brought about the displacement of hundreds of thousands of residents. All the numbers I have cited and even the language I have used (disaster, cataclysm, catastrophic) serve only to hint at the true enormity of what happened that spring day. More than three years have passed since the meltdown, and the ruined facility is still spilling radioactive waste into the ocean. A recent article in The Guardian appeared under the somber headline, “Fukushima Cleanup Progresses, but There Is No Cause for Optimism” (Nov. 13, 2014). In addition, access to the area surrounding the plant is still highly restricted. More than 120,000 former residents remain in a kind of internal exile in Japan, prohibited from returning to their homes and schools and places of business. With regard to the survivors, there are reports of growing numbers of divorces and of families in crisis, of increasing levels of severe psychological disturbances and even suicides. In Japan the date 3/11 has acquired some of the grim overtones that Americans associate with 9/11. It is within such a forbidding environment that Johnston and Eiko undertook their project. They have collaborated before, team-teaching two courses at Wesleyan University, where Johnston is professor of history and Eiko is a visiting artist. One class focused on mountaintop strip-mining in the southern USA, and the other on the World War II bombing of Hiroshima and Nagasaki. As a result, Eiko and Johnston have developed a deep rapport with each other as well as a shared concern about environmental degradation, in particular about the hazards inherent in atomic energy. Both the rapport and the unease are evident in the photographs they made together when they contemplated the aftermath of another kind of nuclear devastation. I should emphasize that these pictures are not those of a photographer who was on assignment to document an artist’s performance. They are carefully composed works of art that stem from mutual effort and understanding. Eiko became renowned in the world of performance art and dance through the works she created with her partner, Koma, that were slow and austere, using minimal degrees of movement. Beginning in the early 1980s Eiko and Koma also made site-specific outdoor performances, and they frequently collaborated with cinematographers and photographers, such as Philip Trager. 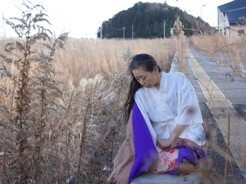 The Fukushima project, then, can be seen as part of Eiko’s ongoing artistic practice, in that she is not performing within a traditional venue such as a theater or concert hall. It breaks with what she has done before, however, because she has chosen to appear alone. In fact the Fukushima series is part of a larger enterprise that she calls “A Body in Places.” It has included her performing solo during a workday in Philadelphia’s cavernous, bustling 30th Street Amtrak station, where commuters became both a temporary audience and a background for her dance. There is another link here. Several of the photographs from Fukushima are set in railway stations that have been unused since the 3/11 disaster. Initially Johnston and Eiko had planned to limit their work to such stations, but their first visit led them at once to explore much more of the surrounding area. In some ways the pictures are quite straightforward. A figure in a landscape—it is one of the most venerable motifs in visual art. It can perform a variety of functions, among them providing a sense of scale or animation, creating a focal point to which one’s eye can return, adding a note of the exotic or affording the viewer a feeling of identification. Sometimes, it is true, the individual all but disappears. “About suffering they were never wrong, / the old Masters: how well they understood / Its human position: how it takes place/ While someone else is eating or opening a window or just walking dully along”—so begins W.H. Auden’s magnificent poem “Musée des Beaux Arts.” Auden’s inspiration was Breughel’s painting of the fall of Icarus, whose tiny “white legs disappearing into the green / water” seem almost a grace note within the larger picture. Johnston and Eiko, however, have chosen to explore the other side of the balance, in which the figure and her setting engage in a dynamic, dramatic interaction. Eiko is the only person who appears before the camera, and her solitary presence is a crucial factor in the emotional charge infusing these photographs. The series also includes several images from which she is absent. Johnston’s quiet, eloquent landscapes afford pervasive evidence of the devastation of 3/11 and of some of the efforts to clean it up. They give a sense of the vast expanse of what we simply call Fukushima, and although they depict a largely deserted landscape, they are full of signs of human activity. Everywhere there are reminders of the fact that this region once was filled with small towns, which had their own houses and shops and roadways. For me such pictures can evoke images from other places and other ages. The eerie emptiness of battered but recognizable buildings calls to mind archaeological sites, especially Pompeii, which underwent its own sudden calamity two millennia ago. At times, sprawled flat on the ground, Eiko too reminds me of the old photographs of the plaster figures from Pompeii, the effigies of the people who fell victim to the eruption of Mt. Vesuvius. Perhaps, in Auden’s words, they were eating, or opening a window or just walking dully along, when they were overcome by toxic fumes and ash. Perhaps the residents of Fukushima were similarly engaged when their world was upended. We viewers happily know, of course, that Eiko is still very much with us, but she does have the ability to project a kind of uncanny stillness. Eiko’s kimono, along with the futon she sometimes has with her, is often the only brightly colored element in a scene. Otherwise there is little brightness, and certainly no joy either in her expression or her posture. With her face a mask of sorrow and her body often folded on itself, she looks like an exhausted wanderer. Perhaps she represents a refugee, like the original residents who were forced to leave behind their homes and possessions. Johnston has said that during their first visit, he kept thinking that they could have been in a war zone. It seems to me that the photographs also contain echoes of post-apocalyptic fictions. I think of books and films in which a solitary survivor has somehow to make her way through a world that has been blasted and whose familiar landmarks have been wrecked.